Construction plans on a 34-mile trail, called “The Peoples Way,” would start as early as September if it gets funding, according to engineer Peter Walker-Keleher with DJ&A. And if all future trail projects also get finished, people could ride their bikes from the Bitterroot Valley to Flathead Lake. 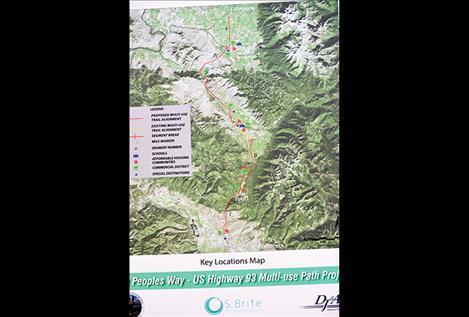 The U.S. Highway 93 Multi-Use Path project, also known as “The Peoples Way,” would be constructed on the southern region of the Flathead Indian Reservation to Missoula. Specifically, the trail is designed as a separate non-motorized route along the highway from where it intersects with Interstate 90 to Dublin Gulch Road in St. Ignatius. The Confederated Salish and Kootenai Tribes Roads Department is seeking funding for the project through donations and from the Transportation Investment Generating Economic Recovery Discretionary Grant, known as TIGER. The grant is through the U.S. Department of Transportation. The proposed project will cost $38 million. 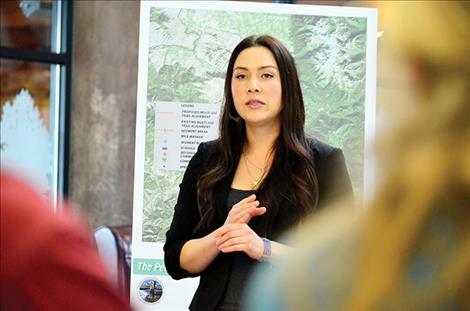 The DOT receives hundreds of grant applications for various projects each year, and community support is one of the factors they consider, so a team of grant writers, historians, engineers, and planners are working on developing the plans for the project and asking people to get involved. 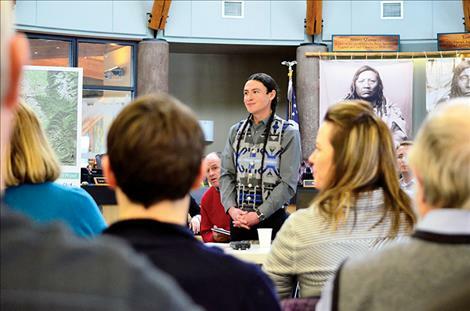 On Wednesday, Jan. 25, people gathered in the CSKT Tribal Complex for a meeting to discuss the project. 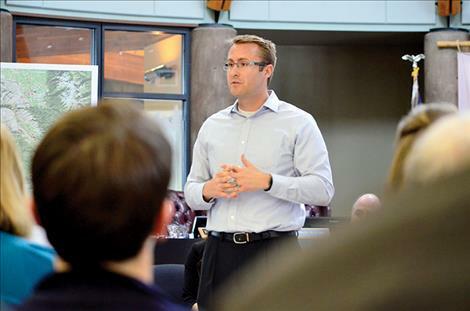 CSKT Project Engineer Casey Ryan talked about the cultural significance of the project. He said the proposed route was known as “The Peoples Way” by generations of tribal people before the area was colonized. They used the path to travel between the Bitterroot Valley and Flathead Lake. Ryan said the construction of U.S. Highway 93 brought change to the way people traveled, and in time, measures were taken to remodel the road to create “harmony” with the natural setting and make it safer for wildlife, but most of the highway doesn’t have a separate pedestrian path for walking, running, and biking. The tribe unsuccessfully applied for the TIGER grant last year, but they were given some recommendations to strengthen it. “We knew going into this project, we had some hills to climb,” said Shivon Brite, grant writer on the project with S. Brite Incorporated. She said the biggest recommendation from the DOT was to get the public involved with the project. The team also decided to split the project into five segments to make their grant application more competitive with other applications. Segment one is from the highway intersection at Interstate 90 to Evaro. The next section is from Evaro to Arlee, and the third section is from Arlee to Ravalli. After Ravalli, construction would connect the path to St. Ignatius. The fifth section connects the path to Dublin Gulch Road. 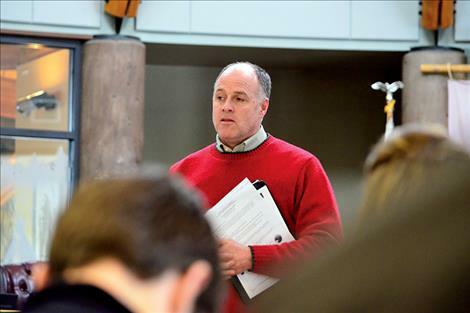 Chris Anderson, president of DJ&A, a Missoula engineering, planning and surveying firm, addressed questions concerning trail construction. He said the trail’s surface would be paved with asphalt, to make it accessible for all people, with a width of 8-10 feet across. He is working on utilizing existing structures to reduce costs. “The side of the road to build on is yet to be determined,” he said. Path maintenance, including weed control and snow removal, was another issue discussed during the meeting. The project team said they were working on that issue and would appreciate community input. One suggestion was to develop volunteer crews. Lake County Commissioner Gale Decker was at the meeting. He asked for the team to include the county in future project discussions. He said maintenance was his biggest concern because people often think it’s the county’s responsibility to maintain trails. “We have the equipment but we don’t have the budget,” he said. The Jocko Valley Trails Committee has worked on a similar project. They developed 2.5 miles of trails in Arlee with donations. Arlee teacher Sue Carney asked how she can get her students involved in the project because they use existing trails, and they want more. If the path is built, it could connect existing trails and plans for trails from the Bitterroot Valley to Flathead Lake. In Lake County, trails currently run along U.S. Highway 93 in Polson and end just north of Ronan. 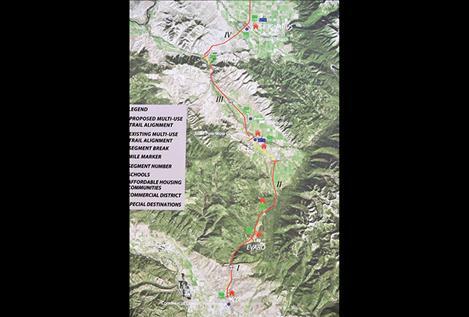 The Montana Department of Transportation has plans to add trails along the highway through Ronan during a road expansion project scheduled for 2018, but plans south of town are uncertain. “The Peoples Way” team asked the public to get involved with the project by sharing concerns, ideas, and support. They asked people to call and write letters about the project to government representatives, including CSKT Chairman Vernon Finley at 406-675-2700 ext. 1007; U.S. Sen. Jon Tester at 406-728-3003; U.S. Sen. Steve Daines at 406-549- 8198, and U.S. Secretary of Transportation Elaine Choa at at 202-366-4000. More information including a petition of support is available at www.bikerunwalkus93.com.